I have a few soapboxes that I like to stand on when it comes to advice on how to take care of your pet. Coming in at the top of the list are the importance of spay/neuter, keeping your dog from getting heat stroke and dental disease. Imagine my horror when I discovered that my own kitty Furla had a grade three FORL! FORL, which stands for feline odontoclastic resportive lesion is a condition that appears to be unique to cats. The lesions are similar to human cavities in that there is a defect in the enamel of the tooth and it is very painful. If your cat is over the age of 5 years old then there is a 72% chance a FORL is present. As with all dental disease, FORLs can lead to increased bacteria circulating in the blood stream resulting in liver, kidney and heart disease. These nasty FORLs are usually found along the outer surface of the tooth where it meets the gum line. They can present in many stages requiring dental radiographs to determine if the tooth root is involved. At the beginning stage an enamel defect is present which then progresses as the FORL penetrates the enamel and invades the pulp cavity, they appear as pink or red defects in the tooth where it meets the gum. As the lesion develops it becomes increasingly more painful for your cat. Treatment entails a full dental exam under anesthesia and surgical extraction of the offending tooth. 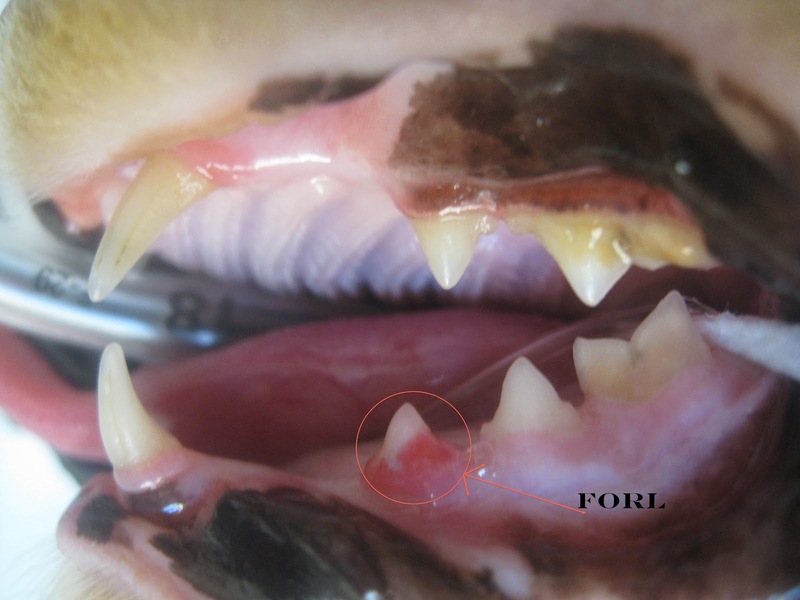 Every few months (I should do it monthly…) I check all my animal’s teeth to look for any signs of dental disease. Usually with FORLs you can see clinical signs such as difficulty eating, drooling, bleeding along the gums and dropping food from the mouth. However, some cats like Furla to not show any signs at all. At eight years old overall she had lovely teeth with minimal tartar and gingivitis – except for that nasty, painful FORL. As I managed my feeling of guilt for neglecting one of my animals I immediately scheduled a dental to address the issue. Here is where it gets even worse – they found a second FORL that had completely resorbed which means it had been there for a while. They also found she had a dead tooth that needed to be extracted. This is the perfect example of dental disease that is lurking under the gumline and cannot be found without a full dental exam under anesthesia. Furla seemed unfazed by her dental and having two teeth extracted, she was happily snacking on canned food a few hours after she woke up from anesthesia. I have certainly learned my lesson and I hope this serves as a cautionary tale for all pet owners about the important of checking your cat’s teeth regularly. Finding and treating these lesions early will result in a healthier, happier kitty.